National Geographic: I'm very happy that one of my photos of Acadia National Park at dawn is featured in National Geographic's 2010 engagement calendar. 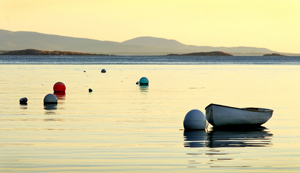 The photo is from the beautiful island of Frenchboro. My Book: Maine Places, Maine Faces continues to sell well and I have book signings coming up at Borders Books in South Portland, Maine on November 28, 2009 and at LL Bean in Freeport, Maine on December 20, 2009. The book has ranked as high as 6th place for hardcover non-fiction as compiled by Borders Books in Maine and reported in the Maine Sunday Telegram newspaper. It's a photojournalistic tribute to the faces and places that make Maine great. Harvard Magazine Photography Award: I'm honored to be the recipient of the 2008 Harvard Magazine Photography Award; and the September-October 2009 issue of the magazine yields my first cover photo for HM. 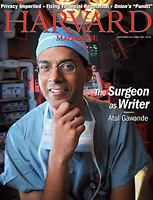 This was a fun and technically challenging assignment at Brigham & Women's Hospital in Boston with Dr. Atul Gawande. He is a gifted surgeon, Harvard Professor and globe trotting health-policy scholar. I've also been selected to photograph a series of Harvard professors through 2011 for a university website. It's a fun project where the mission is to generate distinctive, visually interesting portraits of professors associated with their unique work environments.